Popular YouTube channel Vsauce2 features PNNL research. The microscopic view of a battery discharging during research at Pacific Northwest National Laboratory was featured in a popular science YouTube channel called Vsauce2. At Vsauce2, the YouTuber breaks down sometimes-complicated science news into entertaining and educational video clips for a broad audience. The popular research featured in Vsauce2, and the March issue of the journal Nano Letters, described how PNNL Laboratory Fellow Dr. Nigel Browning, and PNNL chemist Dr. Layla Mehdi used a powerful microscope to watch multiple cycles of charging and discharging batteries. The unique device that makes this all possible is called an operando electrochemical stage. The researchers gained new insight into the chemistry that clogs rechargeable lithium batteries—the kind found in many popular consumer products like cell phones and computers—to understand just why batteries lose their charge so fast. 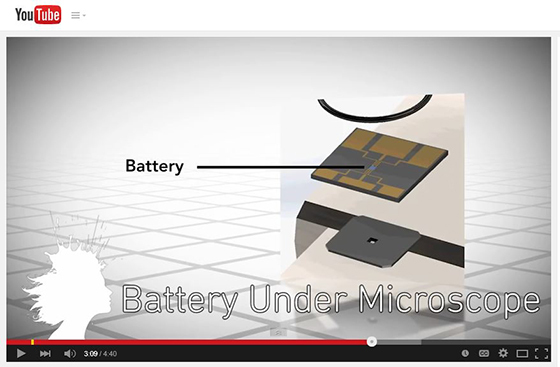 View the complete Vsauce2 video, or the snippet about batteries.